For the many people who break out in a sweat at the very idea of speaking in front of an audience, the prospect of speaking on an unknown topic with little to no preparation is likely terrifying. But you don't have to be afraid of impromptu speeches. As it turns out, the secret even to off-the-cuff speeches is preparation. 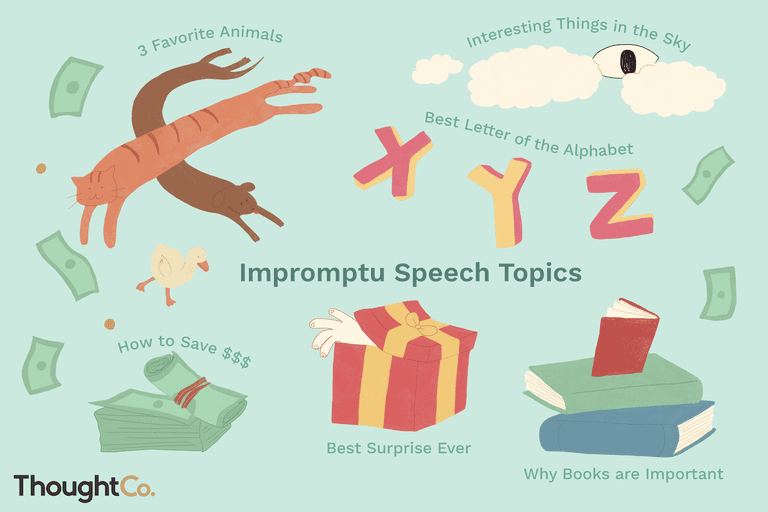 Use this list of impromptu speech topics to practice making a quick speech outline in your head. For each of the topics below, just think of three main points you'd like to make. I don't know anybody who likes to fold laundry, so the first task on my list of unhappy chores is folding laundry. Taking out the trash is another chore that most people dread, and I'm no different. The worst chore in the entire household has to be cleaning the toilet. If you go into your speech with these statements in your head, you can spend the rest of your time thinking up supporting statements as you speak. When you've identified your three main points, think of a great finishing statement. If you end with a great closer, you'll really impress your audience. What you'd find under my bed. The best letter of the alphabet. If I could only eat three foods forever. How to impress your parents. If I could have dinner with anyone. The worst chores at home. If I were in charge of school lunches. Why you need a baby brother. How to annoy an older sister. How to walk a dog.